LOS ANGELES, September 18, 2013 - Image/Madacy Entertainment, an RLJ Entertainment (NASDAQ: RLJE) brand, announces the release of The New Three Stooges: Complete Cartoon Collection . Premiering on television in 1965, the show features animated cartoons with the voices of the Three Stooges - Larry, Moe and Curly Joe - as well as real footage "wraparounds" of the three comedy greats performing short skits to accompany the cartoons. Now, for the first time ever, all 156 cartoons and 40 live action shorts are being released as a complete collection. Also included in the collector's edition package is a CD featuring 12 sing-along and 11 Christmas songs performed by the Stooges. The 5-disc box set will be available on October 15, 2013 for an SRP of $29.98. 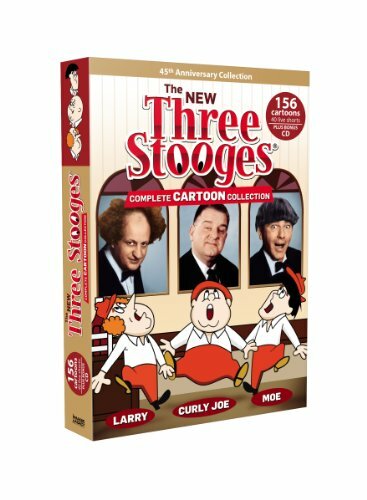 The New Three Stooges: Complete Cartoon Collection joins a long line of Three Stooges DVDs successfully released by Madacy Entertainment since first licensing the brand from C3 Entertainment in 2005. For more information on The New Three Stooges Complete Cartoon Collection, click here. Image/Madacy Entertainment, an RLJ Entertainment (NASDAQ: RLJE) brand, is a premier independent licensee and distributor of entertainment content and programming in North America, the United Kingdom and Australia with over 5,200 exclusive titles. RLJE is a leader in numerous genres via its owned and distributed brands. C3 Entertainment, Inc., the home of The Three Stooges(R) brand, is a diversified entertainment company involved in television and motion picture production, retail sales and the licensing and merchandising of The Three Stooges(R) and other classic brands. For more information, please visit www.c3entertainment.com and www.threestooges.com.